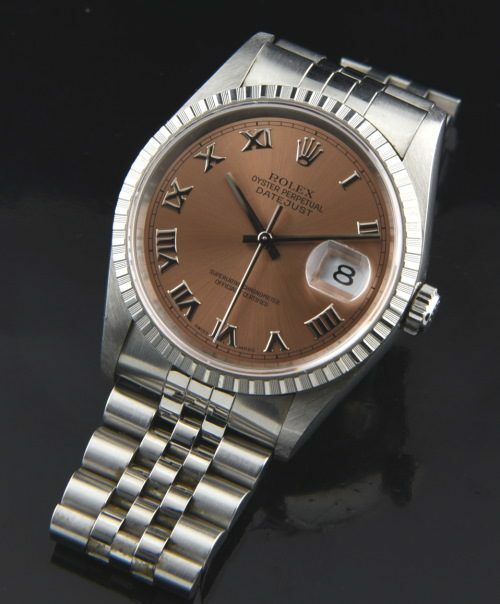 This 1997 (U series) Rolex Datejust 16220 is stunning! Sadly, we photographed the watch prior to simply cleaning the case and bracelet with soap and water. It now sparkles! Any grunge in the photo has been removed. The crystal is sapphire. The bracelet is super-tight. This watch was lightly worn with the original sticker remaining. There is a tiny ding on the lower bezel-is not detracting and could be removed-I would’t bother. The fine automatic ROLEX movement is accurate. The salmon factory ROLEX dial having raised white gold Arabic markers is eye-catching as it reflects the light and draws your eye. I love this dial-I wore this watch for the past month. Many seek out this exact dial and it is not easy to find. This watch gleams “like new” on the wrist.